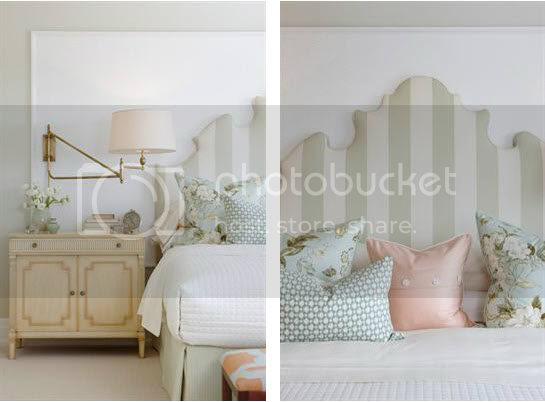 Whether patterned or solid - a fabulous headboard can be the show-piece of the space. I particularly love the detailed sillouette's Sarah tends to use - the above examples are her own custom designs. What's more inviting than a cozy reading nook for you and your partner? It's a good idea to choose chairs that look as appealing from the back as they do in front if the seating will be placed away from the walls. Sarah once mentioned she uses a minimum of 12 patterns per space she designs. 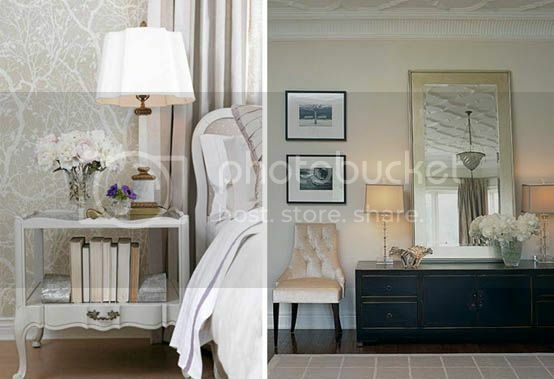 This would include everything from pillows, bedding, rugs, curtains, headboard & furnishings. Amazing how a mix of 12+ patterns can still look so subtle and serene! From a delicate desk chair, to crystal-studded pillows, to bundles of white flowers - a feminine touch makes the room. And a little dose of pink never hurt anybody either! Panelled walls and plastered ceilings create good bones in a space, and it's those kinds of classic details that set a room apart. If this type of detailing is not in your budget, try adding a mirror or artwork with architectural interest like the one seen above. 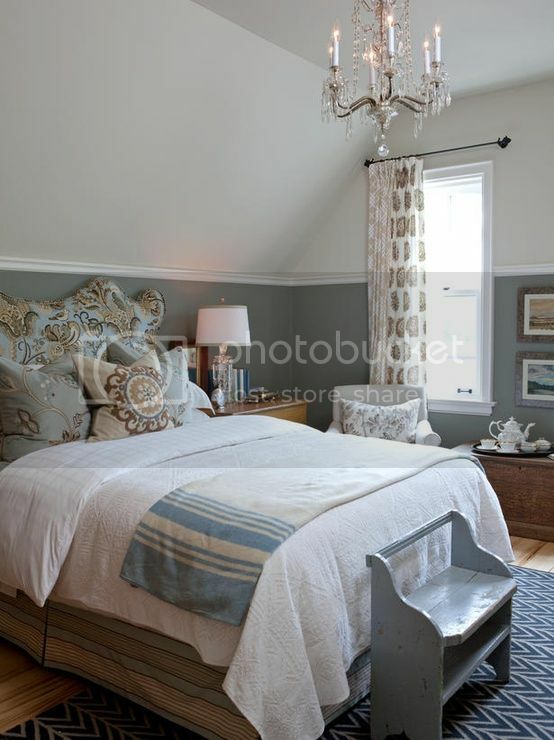 I think this is one detail I will be attempting to add to my own master suite. Any of these on your list? To see more of Sarah's lovely work, visit her portfolio here. 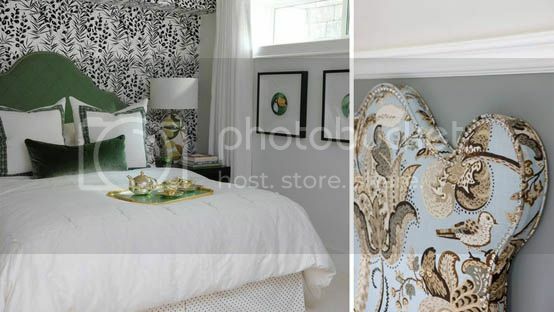 Thank You for sharing Sara'a designs, a LOVE the serene sanctuary feel. I think my favorite is the room with the bold orange accents. Wow mixing 12 patterns! That's insane and I really want to try it! Have to have that first headboard and entire room to be completely honest. Thanks for sharing this lovely post! Surprised to find out that so many patterns are being used. I love to use pattern myself, so this was a fun post to admire! I am drooling over all of the images! I love her use of soft, soothing palettes, and the way she effortlessly mixes so many different patterns together. This makes me want to redecorate my whole room now! Always love Sarah's designs. I would love to own that two toned desk. She really is a master at layering. And it's that kind of layering that in the end creates a cozy sanctuary. I could not worship this woman more if I tried. Her shows fill my DVR. Her photos fill my Pinterest boards. She gets better every year and Tommy is such an unsung design hero for most of these rooms. Great post! Thank you! I too am a Sarah (and Tommy) fan. I like how you break down her bedroom design patterns. She is really smart and practical, not just aesthetic, in her approach. Great post! Thanks Nancy.....she is SO good. I love her functional style and choice of fabrics and colors! 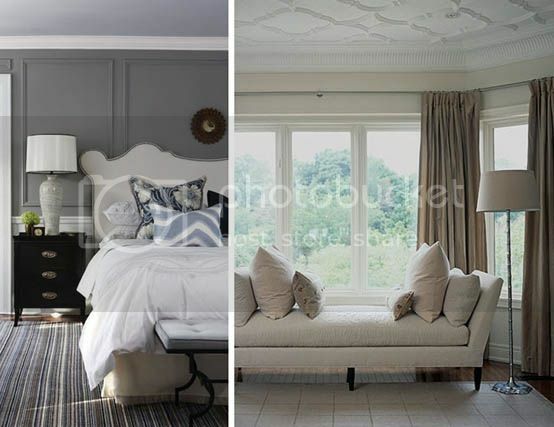 This is great inspiration, I am on the search for a headboard. Thanks!